Today David made a short demo introducing a new Plastic 2.0 graphical user interface alternative. He's been working on different possibilities for the upcoming 2.0 release: from floating (dockable) windows to a more web like rich interface, the one you're previewing today. 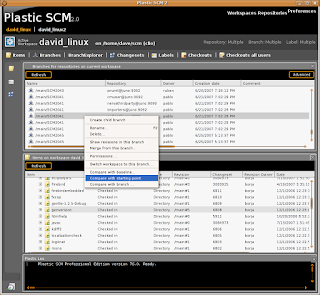 Full Linux support: some Plastic users have been using the GUI on Linux but it's never reached the same level it has under windows. Now we're finally sure we'll make it for 2.0. The screenshot above (and the ones in flickr) are all made on Linux (Suse/Ubuntu). Multiple views: this is something users (and ourselves internally) have been demanding for the last year. Now you'll be able to show the changes made on a task and explore the history without switching views back and forth. Really useful. A better interface to switch between workspaces: now you'll have all your workspaces available and changing will be easier, and also simpler to notice where you're working on. New views: like, for instance, the long awaited changeset view. You can check the latest changes made to the code base using this view (ok, not only the latest but all of them... :-P). The query system finally available from the GUI: all the views are now customizable, and they all work using the query system: you click on the advanced button and you can inspect or customize the query. Attribute queries get integrated too, so you could do things like showing the branches which are not yet not integrated, created the last week and belonging to the user 'dave'... Customizing your own queries to use them later on is also supported. The code review system gets fully integrated into the new GUI too: now you can trigger it from the branches view, the changeset's one, baselines and so on... Inspecting code or making walkthroughs (something we've been doing using this tool for the last two months already) is now much simpler.